Food and drink manufacture matters to every person in the UK, and beyond. 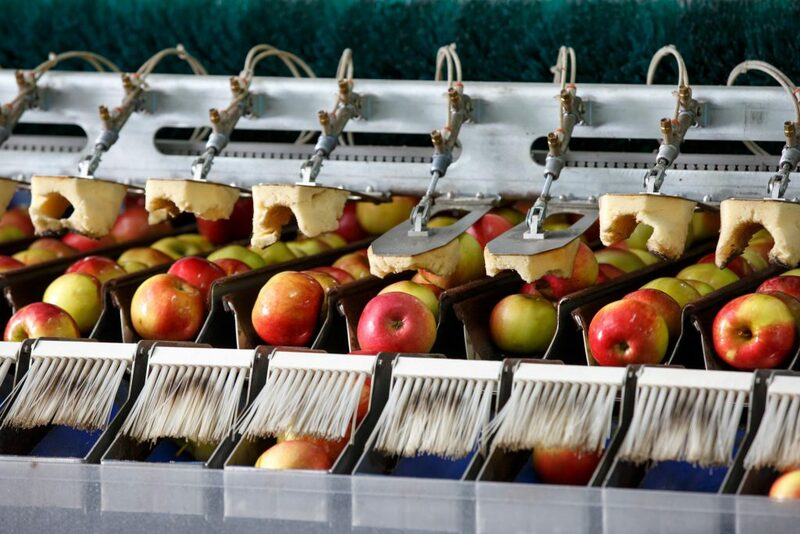 Food and drinks manufacturing is the UK’s biggest industry and plays a major part in the health of the economy. And with the rising cost of food, the environmental impact of agriculture and the rising prevalence of obesity, awareness of food-related issues is almost certainly higher than it has been for decades. Food and drink manufacture is the biggest industry in the UK. Food security affects everyone in the UK. That’s because food production, trade, the environmental impact of agriculture, the threat of climate change, and the factors that affect food prices are all largely global in nature – there is no single solution that any one country can enact to ensure access to affordable, sustainable, safe and nutritious food for all. People feel the impact of food security issues most immediately on their pockets when they buy food. This is the same in the UK as it is across the world. However, individuals in developed countries are better able to ride out food price fluctuations because they spend a significantly smaller proportion of their income on food than people in developing countries. Food price rises have affected UK consumers more than those in mainland Europe. Price is the most important issue for most people when choosing what food to buy. Consumers may be aware of health and environmental considerations, but ultimately the power of the pound (or any local currency) prevails. It’s not difficult to see why: Food prices rose 11.5% in real terms between 2007 and their peak in June 2012 as measured by the Consumer Price Index, following a long period in which they had fallen. Gradual price reductions since 2013 have reduced that real terms increase to 4.1% compared to 2007. Looking back further, to before the recent food price spikes, from 1998-2009, food prices rose by 33% while the mean income of low-income households rose by 22% (before housing costs) over the same period. 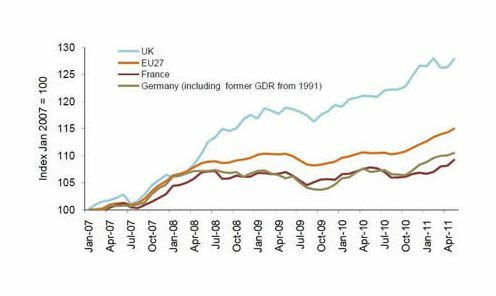 So people are spending more on food than they did only a few years ago, and food and non-alcoholic drink prices have risen by considerably more in the UK since June 2007 than in the rest of the EU. However, balanced against these recent rises, the average UK household now devotes around 9% of its expenditure on food, down from 16% in 1984 (and much, much more before that). Food affects our health in many ways: besides providing us with energy, food contains fatty acids, protein, vitamins, and other beneficial constituents such as fibre, that are essential for our healthy functioning and development. A key part of the food security challenge is to ensure a stable supply of nutritious food, not just calories. But with the persistence of both hunger and undernutrition, as well as overweight and obesity, it could be argued that the role of food in maintaining our health is failing in many areas. While developed countries have much higher rates of obesity than developing countries, obesity is still a worldwide problem. For example, 62.9% of UK adults were classed as overweight or obese in 2015. And obesity is not just a problem for developed countries. 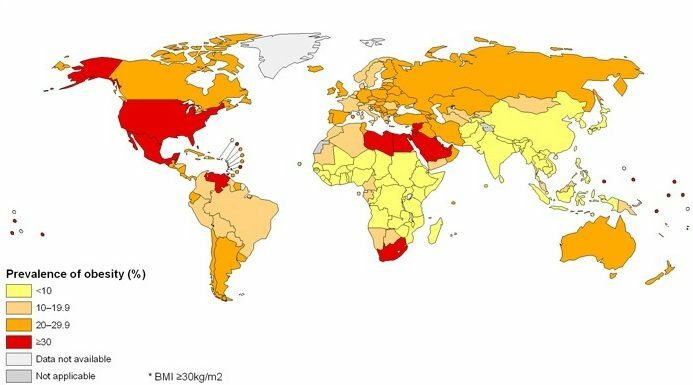 In many developing countries, an overreliance on certain food groups to meet calorific requirements means that health issues related to being overweight are on the rise, such as type II diabetes. Some of this is down to price. As food inflation has bitten, fruit and vegetable consumption has fallen in the UK since 2006 (the year before the 2007-08 crisis), according to both the Health Survey for England and the Family Food Survey report. However, food choices are more widely influenced by our food environments in combination with biological factors. 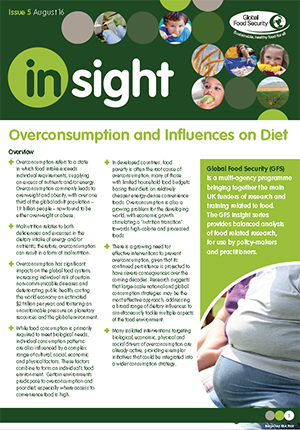 Food environments can be defined as the collective physical, socio-economic and sociocultural context in which consumers make dietary choices (see GFS Insight on overconsumption below). Deep-rooted in wider societal structure, these factors are commonly out of the direct control of the consumer, but combine to create the most powerful influence on consumption. A high quality diet has been broadly defined as a diverse diet drawing on as many food groups as possible, with plenty of fruits and vegetables, wholegrains, fibre and nuts and seeds, while limiting free sugars, sugary snacks and beverages, processed meats and salt, and replacing saturated and industrial trans fats with unsaturated fats. The challenge is how to encourage people to adopt this. Around the world, a significant amount of food is wasted, soiled or eaten by pests before it even reaches a dinner plate. This waste is further exacerbated by food that is thrown away in the home: UK consumers spend an average of £470 per household on food each year that is then throw away – 4.4 million tonnes of edible food nationally. A great deal of UK household food waste is avoidable. An important part of meeting the food security challenge is reducing avoidable food waste. Some trends indicate that UK business and industry are moving in the right direction. 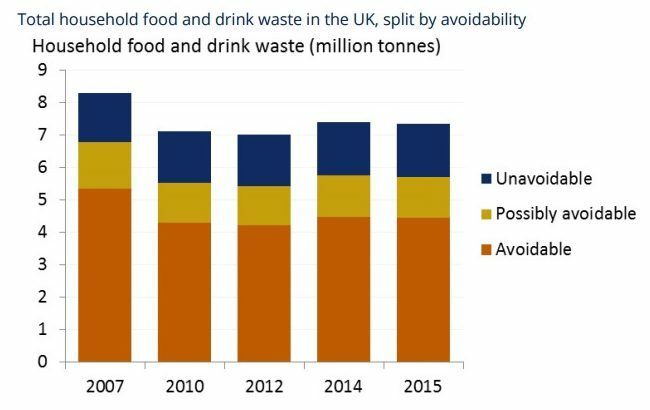 For instance, levels of food and drink waste have been halved by UK commercial and industrial businesses between 2003 and 2009. Furthermore, half of food waste generated by businesses in the food and drink sector is either recycled, composted or reused; the amount sent to landfill is about 8%. On the domestic side, it is estimated that reviewing ‘best before’ labelling could save around 370,000 tonnes per year. Over-consumption is sometimes considered food waste, because the nutrients aren’t needed by the person consuming them. Eating the right amount of healthy nutritious food and wasting less would make a huge contribution to meeting the food security challenge. Information sourced from Defra, WRAP and City University London.